Local delivery of any item is a pleasure at Powell Florist. Our fast, friendly drivers deliver fresh flowers, candy, gifts, silk arrangements and wreaths to homes and businesses in the Knoxville and Clinton areas. Our nationwide network of florists provide delivery of beautiful florals across the country. Our staff of on site, professional floral designers allow us to deliver the freshest, most beautiful flowers and plants on a daily basis. Custom pieces and creative, personalized funeral flowers are available to honor your loved one no matter your budget. 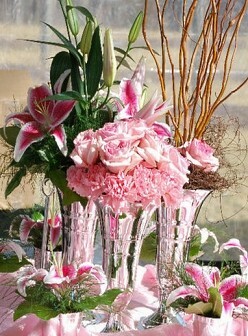 Our style and attention to detail make Powell Florist the primary choice for many area families. Powell Florist loves weddings! Call us to set up a free consultation for your special day. Quick small wedding? No problem! We can provide flowers and decor for small weddings in a snap! We also deliver and install larger weddings at your location. Party and special occasion flowers are available. Powell Florist delivers fresh and silk arrangements and decor for parties, corporate events and businesses all over our area.